Posted By PA Breast Cancer Coalition on June 22nd, 2012 at 9:27 am | 3202 comments. Take a read through our summer edition of FrontLine, our quarterly newsletter. If you would like to register for the 2012 Conference, to sign up for the Take a Swing Against Breast Cancer home run derby, or to find out more about our Grassroots Partners, take a browse through our site! Posted By Kristen on May 1st, 2012 at 8:47 am | 289 comments. 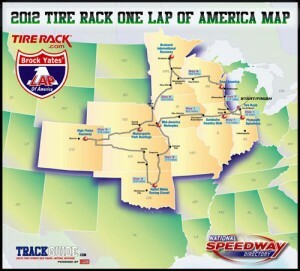 For the second year in a row, Jim Roberts is participating in the One Lap of America! Jim, a Corvette enthusiast from Mount Joy, combines his love of cars and passion for a cure with this seven day race around America. Jim expects to log over 5,000 miles for the 2012 race starting in South Bend, Indiana then off to Plymouth, Indiana, Joliet, Illinois, all on the first day. By the next day, they are due in Council Bluffs, Iowa by 8 a.m. and then off to tracks in Oklahoma, Colorado, Nebraska, Minnesota, Wisconsin and back to South Bend. By the end of that circuit we will have traveled over 3300 miles plus the miles on each of the tracks, all from Saturday to Saturday. Jim and his transit driver Steve Barrett have several sponsors and have once again added a fundraising component to the race. For a donation of $10 or more and they will put a Pink Ribbon sticker on the car with your name or a loved one’s name so you can “ride along” on their One Lap of America! If you would like to donate please send your donation to Jim Roberts at 14 W. Main St., Mount Joy, PA 17552. Please make any checks payable to PA Breast Cancer Coalition. And be sure to follow Jim and Steve as they travel around America over the next couple of weeks on Jim’s blog! Posted By PA Breast Cancer Coalition on March 28th, 2012 at 11:56 am | 1132 comments. By now, if you’re on our mailing list, you should have received the latest edition of FrontLine. The PBCC sends out this print newsletter every quarter to let you know what we’re up to across the state and how YOU can get involved! Take a read through our online edition and share it with your friends! Posted By Pat Halpin-Murphy on February 7th, 2012 at 2:54 pm | 342 comments. It’s the PA Breast Cancer Coalition’s mission to give breast cancer survivors a voice within our Commonwealth. We believe we are that voice in the medical, legislative, insurance and corporate communities. Since 1993, we have dedicated ourselves to finding a cure for breast cancer. Our many acclaimed statewide outreach efforts, along with our grassroots partners raise thousands of dollars for research each year. The money raised goes to people like Dr. Craig Meyers, a researcher at the Penn State College of Medicine. Dr. Meyers recently discovered a nondisease-causing virus that successfully kills breast cancer cells in the laboratory. With the help of our outreach efforts and grassroots partners we can give him the funding he needs to one day conduct human trials that will hopefully lead to a cure to breast cancer. We believe that anyone can help make a difference in the lives of those fighting breast cancer and their families. It’s the creativity and talents of people like you that can truly make a difference. We know that the only way to end breast cancer is to find a cure and believe with your help we can do so. My battle with breast cancer ignites my resolve to make certain that our generation is the last to ever fear breast cancer. As a mother and grandmother, I thank you for joining the PBCC’s efforts to find a cure now… so our daughters and granddaughters won’t have to. Posted By PA Breast Cancer Coalition on December 9th, 2011 at 2:26 pm | 948 comments. 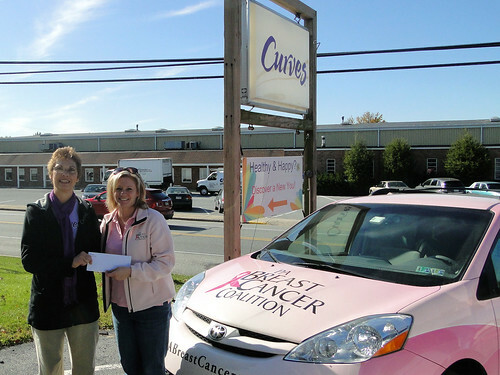 The PA Breast Cancer Coalition is pleased to have joined with Curves of Ephrata for a fundraiser throughout October, breast cancer awareness month. Marsha Lausch (left) of Curves of Ephrata presented a donation of $2,062 to Heather Hibshman (right), executive director of the PA Breast Cancer Coalition. Curves held a silent auction made up of items donated by members throughout the month of October. Thanks for your support right in our backyard! Posted By PA Breast Cancer Coalition on November 8th, 2011 at 9:54 am | 430 comments. HARRISBURG, Pa. – “Pink Ribbon Stories: A Celebration of Life” (ISBN 978-0-9701379-7-5) by 10-year breast cancer survivor Tammy Miller offers hope and laughter from personal stories of battling breast cancer. Miller compiled over 120 entries from women and men whose lives have been touched by breast cancer. Throughout her own diagnosis, Miller used her sense of humor on her journey. She went through her first breast cancer surgery wearing a clown nose and shoes while carrying a kazoo. For her second, she wore a pink feather boa. Miller’s sense of humor and optimism made her journey a memorable one for those around her. 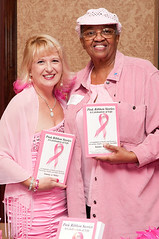 “Pink Ribbon Stories: A Celebration of Life” is available online at http://pbcc.me/PinkRibbonStories or through your favorite e-reader’s store. Proceeds benefit the PA Breast Cancer Coalition. Tammy Miller is an international speaker, author and speech coach. Her speaking topics include humor and healing, presentation and communication skills, brain aerobics, motivation and achieving goals. She is the owner of Tammy Speaks, LLC of Port Matilda, PA, and she enjoys helping others build their communication skills and achieve their goals in life. As an author, Tammy has written, “The Lighter Side of Breast Cancer Recovery,” about her personal journey of using humor to deal with her cancer diagnosis. And, “My Life is Just Speech Material… And, So is Yours,” is a valuable guide to discovering what to say and how to say it with your next presentation. She can be reached at www.tammyspeaks.com. The PBCC represents, supports and serves breast cancer survivors and their families in Pennsylvania through educational programming, legislative advocacy and breast cancer research grants. The PBCC is a statewide non-profit organization dedicated to finding a cure now…so our daughters won’t have to. For more information, please call 800-377-8828 or visit www.PABreastCancer.org. Where is your pink this October? Posted By PA Breast Cancer Coalition on October 3rd, 2011 at 11:22 pm | 118 comments. Cooler temperatures, autumn leaves and Friday football games can only mean one thing at the PBCC…it’s Breast Cancer Awareness month once again! I continue to be amazed at people’s creativity and commitment when it comes to fundraising or special event ideas. I firmly believe that anything you enjoy can become a benefit for the PBCC. Do you golf…ride horses…snow tube…play softball…walk…have a motorcycle…make jewelry? Are you getting the idea? Don’t let your talents go to waste. I challenge you to come up with something that’s never been done before. Every day our phone rings and someone is on the other end with an incredible idea for raising awareness about this disease. Last week I attended a high school ice hockey game. It was Warwick vs. Hempfield…two powerhouse schools in Lancaster County. Marc Wizckowski, a senior for Warwick, turned the game into a fundraiser for the PBCC. He got special jerseys made, got raffle prizes donated, reserved the ice, and contacted local media. He did it all. And in the end, he raised $1,410 for the PBCC in one night. But more importantly, he got an arena full of fans to notice how powerful pink can be. The striking pink ribbons on the black jerseys, the pink grip tape on the hockey sticks, the girl working the door whose hair was pink for that night…it all led to an incredible sense of community and coming together for a cause. That’s what Breast Cancer Awareness month is all about. I look forward to hearing the phone ring again today. Maybe the next amazing idea will be yours. Posted By PA Breast Cancer Coalition on September 28th, 2011 at 3:17 pm | 2313 comments. HARRISBURG, Pa. – A bright pink fountain will flow throughout October at the Pennsylvania State Capitol to commemorate Breast Cancer Awareness month. 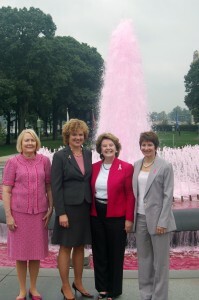 The East Wing Fountain at the State Capitol in Harrisburg turned PINK on Wednesday, September 28th thanks to the First Lady Susan Corbett and PA Breast Cancer Coalition (PBCC). The PA Breast Cancer Coalition was proud to join First Lady Susan Corbett, Sheri Phillips, Secretary of the PA Department of General Services, and Debbie Freer, PBCC Board Member and breast cancer survivor, in celebrating the start of this important month. The pink fountain serves as a breathtaking visual that underlines and signifies the critical importance of education, early detection and treatment of breast cancer. Breast cancer continues to be the most commonly diagnosed cancer in women in the United States, regardless of race or ethnicity. Nearly all breast cancers can be treated successfully if found early. When breast cancer is found in its earliest stage, the five-year survival rate is 98 percent. The PA Breast Cancer Coalition represents, supports and serves breast cancer survivors and their families in Pennsylvania through educational programming, legislative advocacy and breast cancer research grants. The PBCC is a statewide non-profit organization dedicated to finding a cure now…so our daughters won’t have to. For more information, please call 800-377-8828 or visit www.PABreastCancer.org.